As the end of the 19th century neared, the brownstone rowhouses on East 72nd Street off Fifth Avenue fell to be replaced by some of Manhattan’s most lavish mansions. 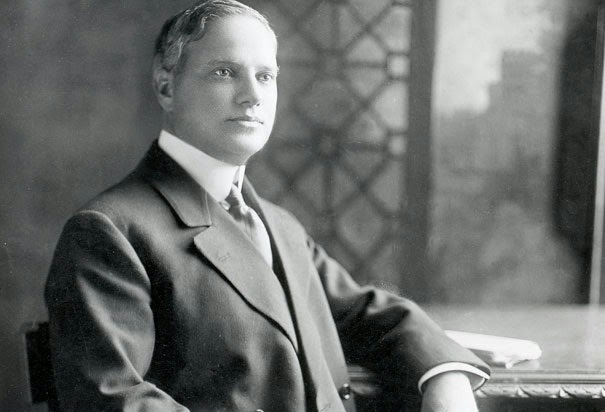 In 1894 Henry T. Sloane began construction of his magnificent limestone palace encompassing three building lots at Nos. 9 through 11; followed four years later by the flanking mansions of Oliver Gould Jennings at No. 7 and Benjamin Guggenheim at No. 15. Guggenheim was one of eleven children born to Meyer and Barbara Guggenheim. Meyer arrived in New York from Switzerland in 1847 and built an immense fortune in the mining business. In 1885, when Benjamin was 20 years old, Meyer sent him to Colorado to take charge of mining operations there. According to The Evening World later, “He quickly recognized the possibilities of the smelting business and induced the family to enter that line.” By the turn of the century the Guggenheims controlled much of the American smelting and refining industry. The brownstone house that Guggenheimer demolished four years later was 20-feet wide--the normal width of a Manhattan townhouse. The architect of the new mansion would have quite the challenge in competing with the magnificent Sloane residence next door, three times the width. The Guggenheim house, to the right, did not attempt to compete with the lavish Jennings and Sloane mansions. Architectural historians generally agree that it was most likely John H. Duncan who designed the Guggenheim house; although records have been lost. Whoever it was, he opted not to compete with the Sloane mansion; but instead to set the Guggenheim house apart by its contrasting simplicity. Dignified and elegant, it matched its neighbor in height; but relied almost solely on two floors of quiet rustication and a stone-balustraded second floor balcony for ornamentation. While the Sloane mansion shouted display; the Guggenheim house murmured refinement. When Benjamin and Florette moved in, their daughter Benita was three years old. Peggy (later internationally renowned for her art collection) was born that same year; and in 1903 Barbara Hazel Guggenheim was born in the mansion. With baby Barbara on the way, John Duncan was commissioned to construct a three-story addition to the rear of the house in 1902 at a cost of $2,000. While most of Manhattan’s wealthiest citizens escaped the summer heat in resorts like Newport, Bar Harbor and Tuxedo; its affluent Jewish population often gathered in New Jersey. The Guggenheims spent their summers in Long Branch, along with other Guggenheims and families like the Rothschilds. One would expect that the curb outside would have been routinely lined with the carriages of millionaires coming and going to glittering entertainments. But things were more subdued. Since 1901 the Sloane mansion had been occupied by bachelor banker James Stillman (the Sloanes had a messy divorce in 1899) and the Guggenheims preferred family affairs to grand social events. When Florette’s father turned 80 on April 14, 1904, however, the birthday celebration was a large affair. Even this, however, was mostly a family event. The New York Times said that “about 100 descendants, relatives, and friends of James Seligman” attended the celebration. And after the toasts and speeches the family opted not to have the expected opera singers or dancers as a diversion. “Mr. Seligman returned his thanks and an entertainment proceeded, in which his children and grandchildren took part,” reported The Times. While Florette stayed home with the young girls, Benjamin routinely traveled to Europe investigating business opportunities. On June 2, 1908 The Evening World reported that he had just returned on the Cunard liner Mauretania. “There is much money now going begging which is awaiting a good chance for investment, and American securities are most apt to get it,” he told reporters. In the spring of 1912 Guggenheim had completed another business trip to Europe and on April 10 he boarded the luxury steamship RMS Titanic to come home to his wife and daughters. Five days later word reached New York that the unsinkable liner was lost. Panicked family members crowded the White Star offices at Bowling Green seeking news of passengers. Apparently the grief-stricken Florette Guggenheim could not imagine living on in the mansion her husband had built for her. Within the month she had taken the girls to live in the St. Regis Hotel. 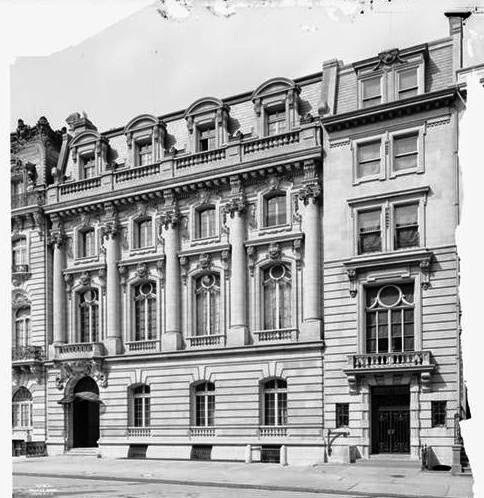 Benjamin’s sister, Cora, who had married Louis Frank Rothschild, moved into the East 72nd Street mansion. Following her period of mourning, Florette turned to the social obligations of introducing 18-year old Benita to society. On Christmas Eve 1913 she gave a debutante dance for her daughter at the St. Regis. In the meantime, Cora Guggenheim Rothschild carried on the charitable work expected of wealthy women. In January 1915 Andre Tridon of the French Red Cross addressed a group of socialites here regarding the organization’s war work. Florette Guggenheim was still living at the St. Regis in August 1915 when word arrived at her attorney’s office, Seligman & Seligman. From apparently nowhere appeared Amy Lurati of San Remo, Italy, who filed a claim against Benjamin Guggenheim’s estate for an annuity of $7,500—a substantial $180,000 a year today. Madame Lurati, whose maiden name was the less impressive Amy Goldsmith, gave no basis for her claim other than “Mr. Guggenheim promised her the yearly allowance in a written agreement made on May 4, 1907,” reported the New-York Tribune on August 10. Florette’s attorneys told the courts they “knew nothing about the woman in Italy or her claim.” Among the bequeaths of more than $450,000 to charities and persons other than Florette and his daughters, Guggenheim’s will did not mention Lurati. While her lawyers dealt with estate issues, Florette Guggenheim dealt with raising over privileged girls as a single mother. In June 1915 she took them to the Gedney Farm Hotel in White Plains, New York. Hazel was now 12 years old—the age when little girls sometimes start flexing their independence. Wealthy 12-year old girls who stormed off in a huff alone were a concern for authorities. The Sheriff was notified and a posse of 15 men began a search. By 2:00 more than 100 persons were combing the area. “About 5 o’clock Deputy Sheriff Moore was apprised by a chauffeur that he had seen a young girl in the woods.” The lawman searched the area and found the headstrong Hazel. “I don’t like it there and I just won’t go back,” she told the sheriff, stamping her foot on the ground. On June 7, 1919 the Real Estate Record & Builders’ Guide reported that Florette had sold No. 15 East 72st Street. “The house was held at about $170,000,” it said. The purchaser was Florette’s sister-in-law and current leaser, Cora Rothschild and her family. The Rothschilds would stay on for years seeing their daughter Muriel married to William Donald Scott on July 28, 1928. The couple’s only other child, Louis, had died in 1902 at the age of 2. They would live in the mansion through the 1940s, but had moved to No. 680 Madison Avenue by the time of Cora’s death at the age of 83 on December 13, 1956. She was the last of Meyer Guggenheimer’s children. The 72nd Street house was now home to attorney and prosecutor John Thomas Cahill. The son of an Irish immigrant New York City police office, Cahill rose to the position of U.S. Attorney for the Southern District of New York in 1939. He sold the mansion in 1957 to Ruth Goodney. Throughout the rest of the century the limestone mansion built by American’s tragic and heroic “Silver Prince” remained a single-family home. Today it is owned by the Kingdom of Morraco and forms, with the Jennings and Sloane mansions, a remarkable glimpse of Manhattan’s opulent 1890s off Central Park. When the Tiffany mansion went up, the Victorian row of the original 6 houses was very nice but when all 6 houses were replaced with refined limestone houses and the awesome Mott B. Schmidt apartment house, the row finally became complete.